Gerard Albanese was a landscape architect in New York who became a photographer after seeing Diane Arbus’s 1967 photograph of identical twins. He studied with Diane Arbus shortly before her death in 1971 and later studied with Arbus’ teacher, Lisette Model. Strongly influenced by Arbus, he similarly sought to find the expression of the universal within the particular subject photographed. Albanese moved to Seattle in 1977, where he photographed on the streets of the city. For an extended period he photographed the homeless in an area along First and Second Avenues, which has since been gentrified. Intent on achieving a high level of contrast in his photographs, Albanese only shot on bright sunny days – of which there are very few in Seattle – and he exposed his photographs for highlights rather than shadows, allowing shadow areas to deepen to black. The contrasty appearance of his prints drew criticism from purist photographers who emphasized technique over ideas, but can now be see as contributing to their compelling sense of rawness. Using varied rhetorical strategies, such as juxtaposing forms to create visual puns, Albanese offers poetic and pointed reflections on a life lived on the streets. In the image (Veiled) Figure with White Shoes, for instance, he creates a visual relationship between a slumped human figure and its surrounding environment. The person's huddled shape resembles the rounded piece of metal in the left half of the image, and his or her body would blend into the urban setting if it were not for a pair of bright white shoes, which are a similar shade to the metal protrusion. 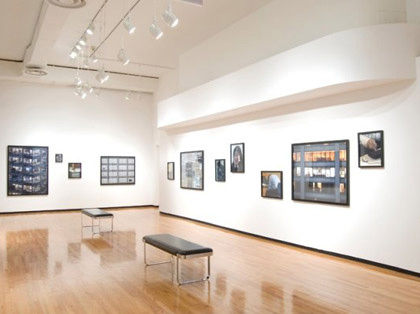 Gerard Albanese has exhibited at the William Traver Gallery in Seattle, WA, and Blue Sky/the Oregon Center for the Photographic Arts, in Portland, OR. His work is included in the exhibition catalog Seattle Now by the Art Gallery of Greater Victoria, BC, Canada (1984), and his work was published in Art in America (September 1988). He is the recipient of a Washington State Arts Commission Fellowship Award (1991). In the early 1990s Albanese left the Pacific Northwest and returned to New York.